KARACHI: Advisor to Sindh Chief Minister on Information and Archives, Law and Anti-Corruption Barrister Murtaza Wahab on Friday said that the government has enhanced the budget of National Institute of Cardiovascular Diseases (NICVD) 120 times by increasing it to Rs8.5 billion from just Rs700 million in 2012-13, which made it a “centre of national unity” where people from all the provinces and areas of Pakistan are coming to acquire state-of-the-art cardiac treatment services. “Even the opponents of the Sindh government are now praising services of NICVD in their speeches, which shows that this facility has not only become a symbol of excellence in Pakistan but in the entire region where patients are being provided free of charge health facilities without any discrimination”, Barrister Murtaza said while speaking at the launching ceremony of ‘Preventive Cardiology Programme’ (PCP) of NICVD. On the occasion, NICVD administration announced the launching of their PCP in commemoration of World Heart Day 2018, saying after providing all the modern treatment facilities to the people of Sindh, they were now focusing on preventive cardiology to minimise the deaths due to cardiac ailments in the country. The advisor said he and his family is aware of the devastation caused by cardiac diseases as he himself lost his father at the early age of 41 but now he is glad to become part of PCP at NICVD, which would save thousands of lives of people. “Sindh government has provided every possible support to NICVD for the provision of best treatment facilities and now this centre is functioning in entire Sindh. Our focus now is to lower the disease burden by increasing awareness among common people about the heart health and prevention from cardiac ailments”, he maintained. Claiming to be a ‘big admirer’ of the NICVD for establishing Satellite Centres in eight different cities of Sindh, he said this facility is now saving hundreds of lives on a daily basis by providing them state-of-the-art treatment facilities near to their abodes. “NICVD is in entire Sindh now and people of Sukkur and Larkana do not have to come to Karachi these days as they are being given the top of the line health facilities in their own cities. Even people from Quetta, Peshawar and Fata are visiting these hospitals and satellite centres in Sukkur and Larkana for being close to them as compared to Karachi”, he claimed. Announcing full support to NICVD in its future endeavours, he said Sindh government would continue supporting not only the NICVD but it would also continue to improve the condition of hospitals and health services at other facilities in entire Sindh. NICVD Executive Director Dr Nadeem Qamar on the occasion saying after introducing all the modern treatment facilities to the heart patients at the NICVD, we have now decided to focus on prevention from acquiring heart disease so that they could become productive members of the society. “We have established the Department of Preventive Cardiology at the NICVD and brought one of the best interventional cardiologists Prof. Khawar Kazmi to head this department and program”, he said, adding that it was the right time to make changes in the lives of people by making them aware of their anti-health lifestyles. Declaring media and government as two major partners in the preventive cardiology programme, Dr Nadeem Qamar urged the media and government to support them and convey their messages to far flung areas of the country. “Media can make people aware in small villages and towns while the government’s support is inevitable for the material resources”, he added. Eminent cardiologist Dr Khawar Kazmi claimed that as per latest data of World Health Organisation (WHO), at least 30 persons are dying every hour in Pakistan, which is an alarming figure as after every two minutes, one person is dying somewhere in Pakistan due to heart diseases. “In this scenario, where 250,000 people die annually in Pakistan, we not only need more treatment facilities but also a comprehensive preventive cardiology programme and strategy to prevent people from cardiovascular diseases,” he said, adding that today was defining a day in the history of NICVD due to the launching of a unique program. He said Pakistan was becoming a nation of ‘diseased and disabled’ persons as every third youngster was hypertensive while every fourth person was diabetic and added that in order to make country prosperous, there is an urgent need for making people aware of health hazards and how living a healthy life. 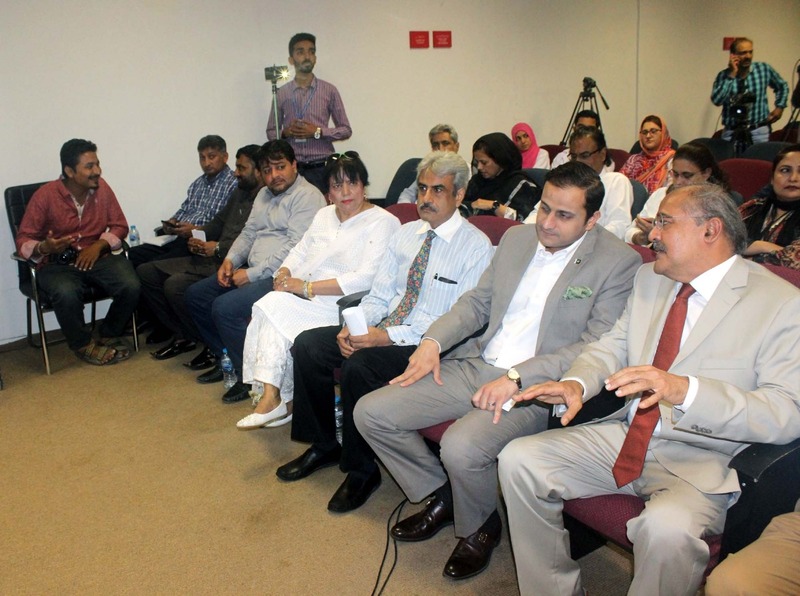 Dr Nabila Soomro from NICVD Rehabilitation Department also spoke while senior professors, cardiologists and experts from different departments were also present.